Dianne Dailey retired this spring after a stellar 30-year career as women’s golf coach, earning a spot in the National Golf Coaches Association Hall of Fame and launching the careers of a steady stream of alumni who became pro golfers. She oversaw 30 team titles, 39 individual titles, four ACC championships, 28 All-Americans, 39 All-ACC selections, four ACC Freshmen of the Year, 15 qualifying teams for the NCAA Championship and 2018 NCAA champion Jennifer Kupcho (’19). Dailey’s five ACC Players of the Year were two-time winner Stephanie Neill Harner (’95), Laura Philo Diaz (’97), Nuria Clau (’03) and Natalie Sheary (’11). 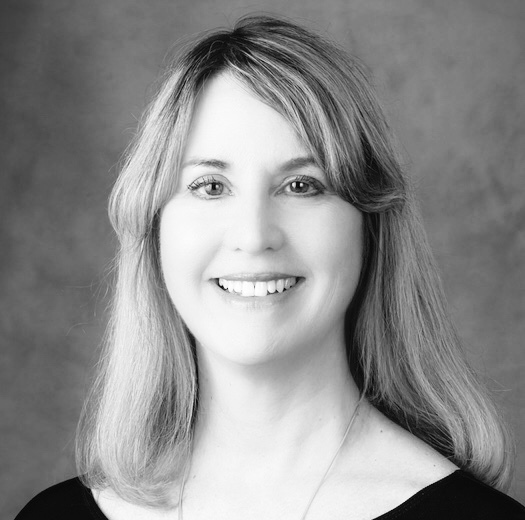 A 1971 graduate of Salem College with a master’s degree in education from N.C. State University, she also played golf professionally for eight years before coming to Wake Forest to coach in 1988. The University’s state-of-the-art golf practice facility on campus is named for her. Q. How did you get started in golf and what do you love about it? I got started caddying for my father when I was kid (in Frankfort, Kentucky). I wanted to play tennis, but I couldn’t find anybody to play tennis with. So I said I’ve got to find something I can do myself and could get better at, and golf was it. I love it because it’s the challenge of it. It’s different every time you go out, whether you play the same course or not. I like competitiveness. And I like the social part of it. It’s one of the few sports where you can actually carry on conversations while you’re playing. Q. What would you say are the most important qualities and skills in coaching? I think being able to listen to the students … to where they are and how they are learning and being able to adjust to their different learning styles, … being a good observer. We’re always trying to learn new things and change with the times and the teaching techniques and the technology, so I think adaptability is a very important thing. 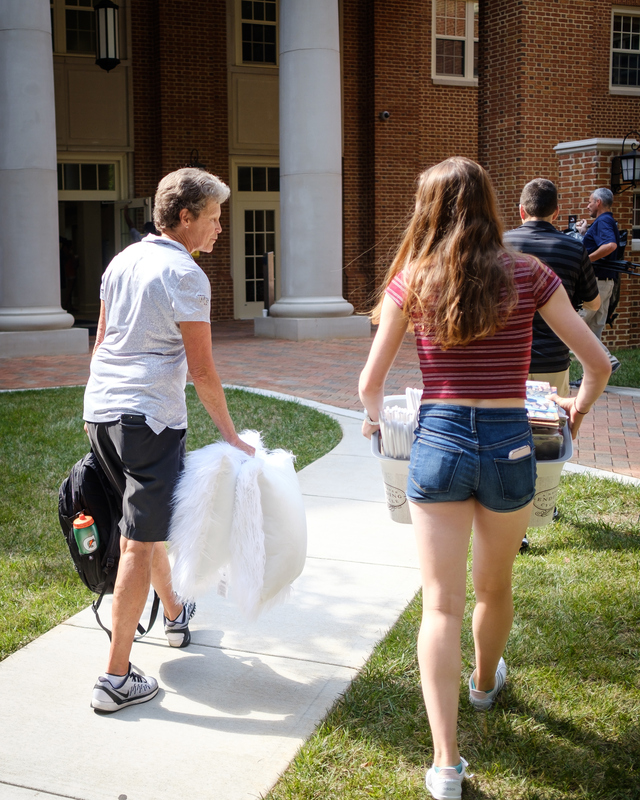 Women's golf coach Dianne Dailey helped golfer Emilia Migliaccio ('21) settle into Angelou Residence on student move-in day in August 2017. Q. How has women’s golf changed over the years since you’ve been coaching? Oh, my. It’s gotten so much better. The skill level is a ton better than it was. If somebody broke 80, that was a big deal back then (in the 1990s.) Now you’ve got to be shooting in the 60s. The fan base has increased because the skill level has increased. Q. What do you say to prospective students about Wake Forest? I tell them they’re going to be in a very supportive environment, that everyone here, their job is to help you be successful, and we’re all working toward that goal. One of the things that I think sells Wake overall is the faculty. … It’s not like you go to class and you regurgitate a bunch of stuff and get your grade. There’s much more interaction, much more engagement. (Students) come in, as I call them, as turtles — get in their little shell, and by the time they graduate, they’re confident, talented and self-assured young women, and that process is the beauty of a Wake Forest education. On the golf side, we have these wonderful facilities. It’s the best on-campus practice facility in the country. Q. Why do you think Wake Forest has such a strong golf tradition? Again, the education as well as the facilities. Jesse (Haddock, ’52 P ’68, the retired men’s golf coach who died in March) was just a great recruiter. And on (the women’s) side, we’ve been building it up the same way, trying to look for the best people and the best students. 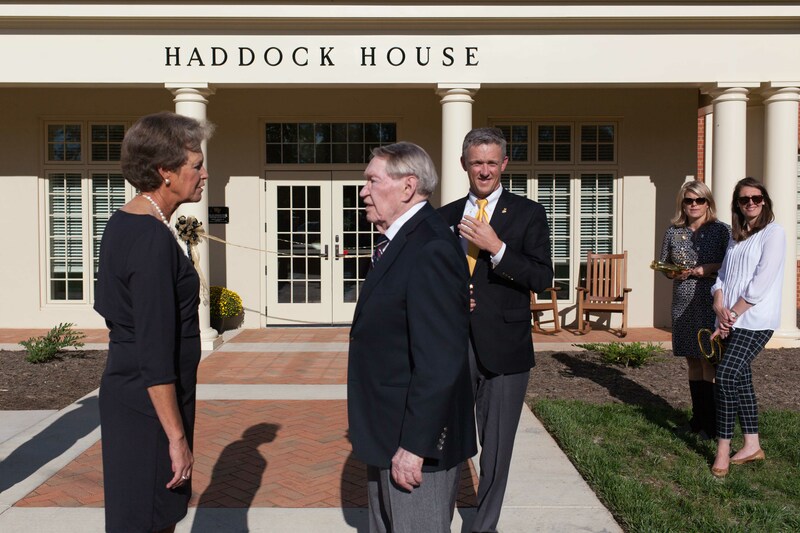 Dianne Dailey greets retired Coach Jesse Haddock (’52, P ’68) in October 2016 during the opening of the Haddock House. Dailey credits Haddock, who died in March 2018, with setting the tone and recruiting standards that helped build Wake Forest’s tradition of golf excellence. Q. You joined the professional golf ranks at age 30. What drew you to do that? I was working over at Salem (College) as assistant academic dean, and I was also working on a doctorate at Duke in higher education administration. I wanted to be a dean of students. And I was trying to play golf. People were saying, ‘You ought to turn pro,’ and I said, ‘I’m too old.’ And then I thought, you know, I ought to just try it. If I make it, fine; if I don’t, I can say I tried. I don’t want to look back and have any regrets. I said I’m going to take a year’s leave of absence (from Salem) and get my (doctoral) degree and play golf. I went up to qualify (in Chicago) and got the last spot and never looked back. Just one or two shots here or there, and I’d be a dean of students or something like that. These little things change your life. Q. Have any of the contacts you’ve had since you retired particularly touched you? I’ve heard from a lot of students who have written to say, ‘Remember that time you told me in the parking lot I could play professional golf? I never thought I could do that, and that made a big difference.’ It makes me feel like I’ve made a difference for some folks, and that’s all I wanted to do. Q. What are your plans for retirement? Do you still play golf for fun? I’m looking forward to doing some volunteer work. I’ve never been around here much to give back, and I’d like to give back. Jennifer Kupcho ('19) was the 2018 NCAA women's golf champion. Q. What will you look back on as your best memory in your career at Wake Forest? There’s so many. The team that won the ACC championship, in ’95, we came from 10 shots back the last day, and then that team went on to finish third in the NCAA. Then this year, we were not expected to do much. For them to come from 10 shots back in our regional and then win in a playoff, that was really, really special, because these students have worked so hard. I couldn’t have picked a better last team to coach. They were so different in personalities, but they all came together with a common bond, and they played for each other. That’s why we coach. Q. What is there that I haven’t asked about that you want to tell us? I feel very grateful and fortunate to have been here at Wake. People would always say, ‘Do you ever think about leaving?’ and I would say no because I absolutely believe in the mission of the school. I couldn’t imagine a better place to be. The athletic department and Mr. (Ron) Wellman (P ’98, ’01, athletic director) have been extremely supportive of me and our program. This is heaven to me.